Awaken to a sun-drenched bedroom view of Lake Coeur d'Alene. Sip morning coffee in one of the lake view sun rooms. Take an early, refreshing dip in the lake, have lunch at a sidewalk cafe or the incomparable Hudson's Hamburgers, and plan a day at the beach or seeing the sights. Later, walk across the park for a supper cruise or an evening of downtown dining and entertainment; then stroll home with the moonlight reflecting across the shimmering water. Fall asleep, stars shining through the skylight. The recently refurbished Gumprecht House is situated on the shore of beautiful Lake Coeur d' Alene in picturesque Northern Idaho. It offers spectacular views with comfortable and spacious family-friendly accommodations, plus close proximity to downtown shops and restaurants as well as the amenities of the famous Coeur d'Alene Resort. Enjoy water sports, lake cruises, bike trails, hiking, golf, antique shops, museums, snow skiing and nature's beauty. History:: The Gumprecht House sits on property once part of Fort Sherman, founded in 1878 to protect settlers, one of a string of forts built in response to the 1876 Custer massacre. After the fort was disbanded, the property was auctioned off. It was then subdivided in 1905. The lot was purchased in 1906 by the Nevers family and the house built in 1907. It was the first private beachfront house, had the pick of the lots and, consequently, an unsurpassed view. For many years the house was occupied, then owned, by the Graue family who graciously allowed the Gumprechts and others to use the beach. The Gumprecht family acquired the property in 1977 and extensively remodeled in 1981. Elderly grandchildren of the original owner knocked on the door in 1982 to tour the changes and warmly approved. One of them had actually been born in the original master bedroom. They had all passed by the house on annual summer visits to Coeur d'Alene but had not been in the house since before 1920. Bike Storage: Bikers should like our property as there is a side entrance that proceeds directly to the finished basement which is suitable for keeping their bikes. There is a bathroom and shower in the basement as well that could be useful for runners or others. The Ironman Triathlon starting point is across the street and the 24-mile Centennial trail passes directly in front of the house. And, yes, we have a large pasta pot. Family room & game room: To provide a break from the elegant main floor spaces the back porch was enclosed years ago, creating a casual and comfortable family area just off of the kitchen and breakfast nook. It contains an Big Screen HDTV, Blu-ray player, Xbox and DVDs as well as a broadband Internet connection for your laptop. See an earlier description of the game room located in the basement. We aim to accommodate families with children so, in addition to the game room with Wii, foosball, air hockey we provide a pack-n-play, high chair, stroller, 3 booster chairs, coloring books and crayons, board games, dollies, toy trucks, blocks, legos, giant legos, etc. Kids always love it and can whoop it up all they want with minimal disturbance of adults. For the elders, the West sunroom has a TV and blu ray, with French doors that can be closed to provide peace and quiet. Dr Donald G. Gumprecht was a resident of the Fort Grounds from 1951, growing up a block away from the beach, down Military Drive in a house now known as the Doctors' Inn. He swam nearly every summer day at 'Graue's beach' and in 1977 was fortunate enough to purchase the house and beach property from the Graue family. In 1990 he relocated to Springfield, Illinois, and kept a caretaker in the house until 2005. Since that time, the house has been offered as a vacation rental for the enjoyment of a wide variety of individuals, families, and groups. Every attention has been given to making the house enjoyable for visitors of all ages and interests. Universally positive reviews have been very gratifying. The absolutely best location and accommodation to be had. We believe we have gone out of our way to accommodate families with a range of ages. Some of our happiest and repeat customers have been grandparents that book a fun vacation to be with their children and grandchildren. This house was the first private lakeshore house built in Coeur d'Alene and had the pick of the lots, enjoying the very best view, sandy beach, proximity to the downtown area and the amenities of the Coeur d'alene Resort as well as the city park with its Fort Sherman-themed playground. Read our listing for detailed information and see also the Coeur d'Alene Visitors Bureau web site. It has lots of room and is set up to accommodate all ages, especially families and groups of families. Amenities for children include Pack-n-Play, High Chair, Stroller, Booster Chairs (3), Coloring Books and Crayons, Game Room with Wii, Air Hockey, Foosball, Game Chairs, dollies, Dollie stroller, toy trucks, legos, giant legos, blocks, board games, etc. 2 blocks away with more than a dozen sidewalk cafes, quaint shops galore, and the world famous Coeur d' Alene Resort. The Coeur d' Alene Resort (2 blocks away) was named by Condé Nast Travelor magazine the #1 resort in the world in 1994. One of the world's most picturesque lakes Lake Coeur d'Alene is one of the more famous lakes in the U.S. The beach is an integral part of the property. Grassy area for towels, chairs, picnics above retaining wall with 6 stairs to the sand--all part of Gumprecht Beach. 8 rooms in the house have a lake view: 3 bedrooms, 2 sun rooms, the parlor, the piano room, and the dining room. The views of the water are spectacular. The property is waterfront property. Finished basement laundry room with washer, dryer, iron, and ironing board. (3) Kitchen Fridge with icemaker, game room smaller fridge and master suite mini fridge. Drip coffee maker and Keurig in Kitchen. Mini drip and mini Keurig in master syuite. Formal dining room plus breakfast nook with counter and table accommodates 12 in total. An assortment of books including the Good Housekeeping cookbook, the Holy Bible, and a children's Bible. A large basement room with Foosball, Air Hockey, TV and Wii, in addition to the toys. Kids can whoop it up without disturbing the adults upstairs. Legos, trucks, doll stroller, dollies, coloring books, checkers, etc. We try to replenish the dollies each spring as apparently little girls tend to fall in love with their dolly and can't part. Table and chairs in a nice, private back yard. Beautiful, very well kept public course 2 miles distant and a host of other within very reasonable distance. Bike storage--side entrance directly to basement where bikes can easily be stowed adjacent to the bathroom and shower. 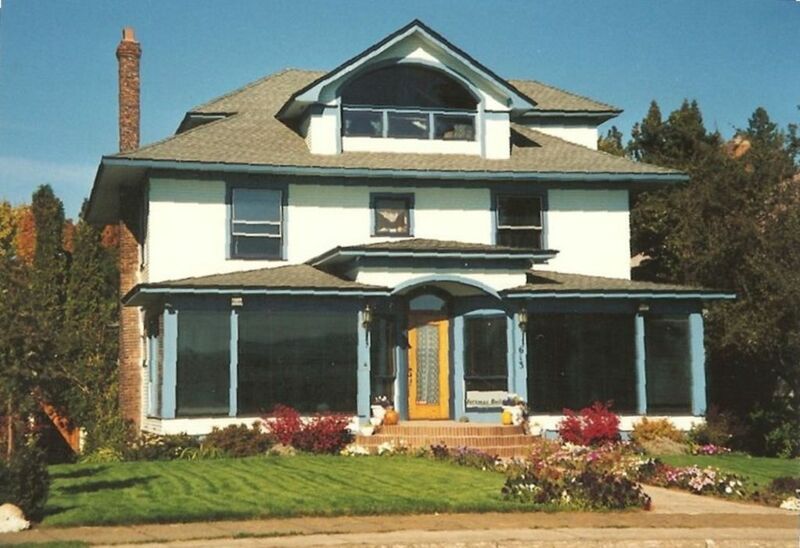 This is a beautiful home very close to downtown with an incredible view of the lake. This has is very comfortable with all amenities. The location cannot be beat. Thank you. We are glad you enjoyed another stay. The lake and resort are beautiful in winter and we intend the house to be cozy. We loved our stay at this house! This was a wonderful place for our family to stay ... so comfortable and family friendly for all ages! The "kids" ( 20, 21 and 3) all enjoyed the game/toy room and we ALL enjoyed the great view of the lake and the easy access to the Resort. Everything was extrememly well appointed and we didn't feel we ever were lacking anything we needed for cooking, sleeping, or just hanging out enjoying family time. Loved having the supply of books, games, and DVD's to choose from too. Our property management contact person was immediately available and accessible for any questions or needs that came up. All in all we were thrilled and would love to stay here again! It is heartwarming and satisfying to know your family so enjoyed their stay. Every member of our team (owner, agent, handyman, cleaning lady) takes personal pride and pleasure in providing a wonderful, family-oriented experience. We try our best to anticipate our renters’ needs and make steady improvements as time goes along. Thanks again. Our family loves this house, so much so, we have used it for about 8 years now. The location is perfect, able to walk downtown. Plenty of room, always neat and clean. I highly recommend if you have a large party, and the kids especially love it. Thanks for another great stay Donald! Thank you for the very nice comment. As a much appreciated regular visitor you are undoubtedly aware of how much joy and pride our whole team takes from happy, satisfied customers— particularly families. We have walked by the house for years and always wondered what it would be like to stay there. It was perfect even in the cooler October weather. Thank you! We have always thought that the lake provides interesting views no matter the season. Thanksgiving, Christmas, and New Years add the cheeriness of the Resort’s lighting themes. Great location with wonderful view! Your house was perfectly equipped for our visit and we loved the location next to City Park, Tubbs Hill and downtown. Hudson's was a highlight (breakfast and lunch) and we were so excited to order the way locals do, thanks to the tip sheet! Thank you, thank you, thank you for sharing your beautiful home with us. Can't wait for our next trip and a pickle both! We are sooo glad you enjoyed your stay so much! It makes it all the more enjoyable for us as well. Over the winter down season we plan upgrades to the house that should make it even more fun. We loved spending a week in the famous Gumprecht house. It was everything we wanted, in a location that was perfect for shopping or watching the water. We had 10 adults, all cousins celebrating a reunion and we loved being able to connect in different locations in the house. With two sun rooms in the front, a living room big enough for everyone, a large dining room and a kitchen eating area, we were able to spread out and not feel a bit crowded. Beds were cozy and the kitchen was well stocked with every imaginable utensil and gadget. It is simply the best value on the lake and we loved it! Thank you! Such praise is what makes it so enjoyable to make the house available. Over the winter we intend to make several upgrades that should add even more value for our guests, so stay tuned! Thanksgiving, Christmas Eve, Christmas, New Year's Eve, New Year's day add $150.